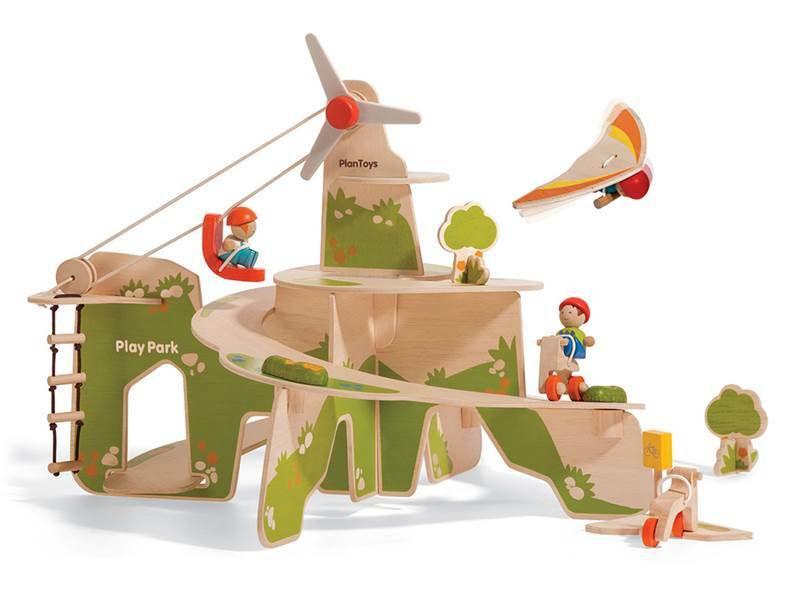 The new and awesome Play Park made by PlanToys is loaded with fun play options for kiddos ages 3 years and older. The set is an adorable playground where your child’s tiny dolls can zip up and down on a cable car that moves from the ground to the top level, two bikes for low-emission exercise and transport, a fun glider, climbing ladder and a wind turbine that really spins. There’s also a relaxing resting area, little shop and the three sweet family figure dolls are included. This is the type of toy that encourages eco-minded outdoor active play. Plus, like other PlanToys offerings, this set is made with eco-friendly rubberwood and child-safe, non-toxic finishes and paints. The new and awesome Play Park made by PlanToys is loaded with fun play options for kiddos ages 3 years and older. The set is an adorable playground where your child's tiny dolls can zip up and down on a cable car that moves from the ground to the top level, two bikes for low-emission exercise and transport, a fun glider, climbing ladder and a wind turbine that really spins. There's also a relaxing resting area, little shop and the three sweet family figure dolls are included. This is the type of toy that encourages eco-minded outdoor active play. Plus, like other PlanToys offerings, this set is made with eco-friendly rubberwood and child-safe, non-toxic finishes and paints.